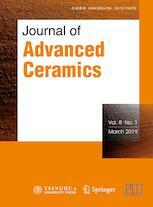 Journal of Advanced Ceramics is an international journal published under the brand SpringerOpen that presents the results of theoretical and experimental studies on the processing, structure and properties of advanced ceramics and ceramic-based composites. Coverage spans a wide range of ceramics-related topics, including Processing (powder preparation and characterization, novel sintering techniques) Structure characterization (including nanoscopic, optical, electrical and magnetic characterization), Properties (mechanical, electrical, ferroelectric) and Advanced materials (transparent ceramics; lead-free piezoelectrics; ferromagnetics and solid oxide fuel cells). Journal of Advanced Ceramics is published on behalf of the State Key Laboratory of New Ceramics and Fine Processing (Tsinghua University) and the Advanced Ceramics Division of the Chinese Ceramic Society.